I must have a very robust constitution because I managed to arrive in middle-age more or less in one piece! About one and a half stone heavier than I wanted to be, but fairly content with my life. Every now and again I’d try and lose a bit of weight, do a bit more exercise and swear I’d cut down on the red wine and fags. Then two things happened in 2007 that made me wake up. At the beginning of the year my grand-daughter was born and at the end of the year after a sad struggle with dementia, my mother died. Suddenly it seemed to be ridiculous to be poisoning myself on a daily basis – how long could my body hold out before the rot set in – literally! So I gave up looking for ways to lose the Middle-Age Spread, and decided to do research into a healthy lifestyle. Out went the cigarettes and red wine (and all other alcohol), tea and coffee followed and then out when meat and dairy (this was the easiest for me as I’ve never really liked meat or cheese). Reading about Raw Food I was immediately struck by the idea that ‘live food=live cells’ and ‘dead food=dead cells’. We all know the phrase ‘you are what you eat’ and I decided that anything I was going to put inside (or onto) my body had to help, not harm it. Eating 70% raw food seemed the ideal solution – the rest is made up of cooked vegan fare. To change anything in life we have to change out habits, I teach the Alexander Technique and this is at the core of the teaching – it is also the key to making a success of the Raw Food Diet. To become healthy, to look younger, to lose weight, we have to abandon the habits that got us where we are now and replace them with habits that will allow our bodies to do what they’re designed to do. If we get out of the way and feed our bodies the right fuel they will try their hardest to heal themselves. We have a second chance, there is always hope that the body will overcome the obstacles we’ve strewn in its path and given time, it will rebuild itself from the inside out. I’m now at my ideal weight, my mood has improved out of all recognition, my hair shines and grows like the clappers and perhaps best of all, my insomnia is a thing of the past. I have boundless energy and look forward to daily yoga and trips to the gym. 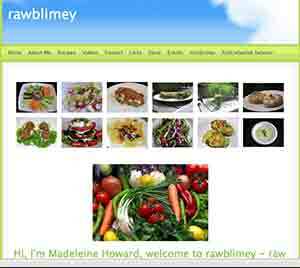 Rawblimey is my website – I started it for fun, it’s got tips and recipes which I hope will help to guide the way to a healthy, alkaline, raw vegan diet – enjoy it! Madeleine Howard is the owner of the website rawblimey. She is also an actor, Alexander Technique Teacher and her great love is researching healthy food for herself, family and friends.